"Anglo-America," "Hispano-America," and "Gods of the Modern World." 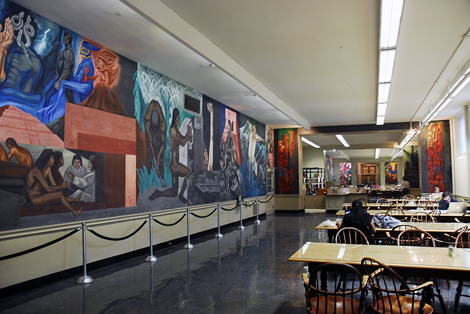 Mexican artist José Clemente Orozco painted the Epic of American Civilization murals in the Baker Library at Dartmouth College, finishing them in 1934. Considered a seminal work of one of the most significant 20th century artists, the murals are composed of 24 individual panels covering all four walls, approximately 3,200 square feet, of the Reserve Book Reading Room of the library. In these frescos, Orozco was depicting the impact of indigenous and European peoples on North America and reacting to the horrors of the Mexican Civil War and World War I with murals that portrayed the adverse impacts on the human spirit of nationalism and the rapid pace of industrialization. The prescient nature of these murals predicted the rise of militaristic ideologies leading up to World War II. Orozco, along with Diego Rivera and David Alfaro Siqueiros, was responsible for introducing and popularizing Mexican mural art in the United States. He was a key figure in bringing Mexican culture and art to the forefront of North American artistic consciousness, leading to the mural movement of the New Deal where the Federal Arts Project commissioned murals by American artists based on the model of the Mexican mural movement. Spain’s long tenure as a colonial power in North America greatly influenced American culture as well as the United States’ relations with Mexico and other Latin American countries. Opinions of Hispanic culture and influence were negative during the 18th and 19th centuries, and Americans often downplayed the cultural ties and connections between Latin America and the United States. While many Americans continued to view Mexico, Mexican culture, and American citizens of Mexican descent through a negative lens, perceptions of the relationships between the U.S. and Mexico and of the nation’s Latino legacy changed in the early 20th century. This change paved the way for the commissioning of Mexican artists like Orozco to work in the United States as critics romanticized and acclaimed the value of Mexican and Indian art. 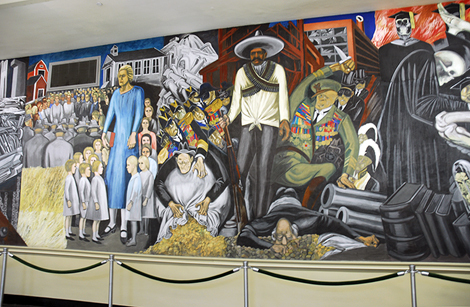 Orozco completed painting the Epic of American Civilization murals in 1934. They are located in the Baker Library at Dartmouth College. The location of the Epic of American Civilization frescos in a New England college originally founded to educate Native Americans, was intentional for Orozco who sought to depict the long story of interaction between the native population and Europeans in his murals. Baker Library is located in the center of Dartmouth’s campus. Orozco was a visiting lecturer in the art department at Dartmouth College in May of 1932. He began work in 1932 and completed the project in 1934. Orozco’s aim with the murals that are true frescos painted directly on the walls was to examine and contrast the impact of two civilizations on the North American continent. The murals progress logically from the “Migration,” “Ancient Human Sacrifice,” and “Snakes and Spears” panels on the west wall portraying the first people on the continent. On the north wall “Aztec Warriors” and “Coming of Quetzalcoatl” precede “The Pre-Columbian Golden Age,” which portrays the height of civilization for Mexico’s Aztec people before the Europeans came. “Departure of Quetzalcoatl,” “The Prophecy,” “Totem Poles,” and “Machine Totems” continue the progression to “Cortez and the Cross,” which portrays the arrival of Hernando Cortez and the fighting during the European conquest of the Aztecs. The murals then go on to the mechanization of civilization and the impact of industrialization in the United States with “The Machine,” “Anglo-America,” “Hispano-America,” “Gods of the Modern World,” and “Symbols of Nationalism,” all portraying negative images of humanity. On the east wall are panels entitled “Modern Human Sacrifice” and the “Modern Migration of the Spirit,” “Chains of the Spirit,” and several murals of “Modern Industrial Man” focusing on North American and Latin American cultures and how their European and indigenous aspects complement each other. Visitors to the Baker Library can view the murals, which Dartmouth’s Hood Museum administers, using self-guided audio tours or by signing up in advance for a docent led tour. Brochures containing detailed information on the murals and what they represent are available for the public. Books with more in depth information on José Clemente Orozco and the techniques he used in creating the murals are available for viewing while in the library. The Epic of American Civilization murals are located in the basement of Dartmouth College’s Baker Library, 6025 Baker-Berry Library, Hanover, NH. There is no cost to enter the library. Hours vary depending on the time of year. For more information, visit the Baker Library website. Visitors are able to listen to self-guided audio tours on iPods; iPads also are available for use in the exhibit. Free docent led tours are conducted through the Hood Museum on an as needed basis. Please contact the Hood Museum at least one month in advance of your visit to schedule a tour by e-mail hood.museum.tours@dartmouth.edu or phone 603-646-1469. Click here for the National Historic Landmark file: text and photos.